In recent years we have invested heavily in separate waste collection and the recycling of waste as we are aware that nothing must be wasted and that everything can be recycled or reused. There are bins for the separate collection of waste at all sites and new agreements for the collection and recycling of materials were introduced in both 2012 and 2013. In order to increase the effectiveness of these measures, many companies have carried out special campaigns to raise employee awareness about separate waste. 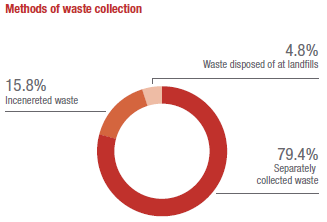 In 2013 a total of 72,518 hundred kilograms of waste was tracked (-3.4% compared with 2012), of which 57,588 was collected separately, 11,484 incinerated and 3,445 disposed of at landfills. Paper and cardboard, plastic, glass, aluminium and other metals, wood, wet waste, used oil, sanitary waste, hazardous waste and IT and toner waste are subject to separate waste collection. 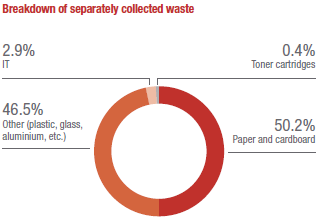 Per capita waste comes to around 2.2 hundred kilograms, a 7.3% fall compared with 2012. Given our insurance-financial activities, the majority of our separately collected waste is made up of paper and cardboard. At some sites, employees have special bins exclusively for paper and cardboard waste. In all countries, IT waste, comprising of discarded electronic devices, is returned to suppliers or to plants responsible for disposal and the retrieval of reusable parts. IT waste trends may follow the cycles established for the replacement of obsolete devices with new devices that are more sustainable from an environmental point of view. The majority of used toner cartridges (3 out of 4) are returned to suppliers to be recycled or refilled, while the remainder are disposed of in accordance with the law. Hazardous waste (neon tubes, batteries, etc.) represents only a tiny percentage (0.4%) of separately collected waste and is disposed of separately in an appropriate manner using specialist companies and by maintaining registries and mandatory documentation, as per the relevant regulations in force in the various countries. More specifically, during the year 243 hundred kilograms of hazardous waste was collected together with 0.6 hundred kilograms of sanitary waste, such as gauze and bandages, which was used at sites where there is an infirmary. In Austria used oil from the corporate canteen is collected by a specialist company that transforms it into biofuel. Since 2012 in France, the organic waste from the corporate canteen in one of the Saint Denis sites has been disposed of using an internal incinerator; this process has made it possible to improve the management of spaces and reduce disposal costs, and has also had a positive effect on transportation, as the waste no longer needs to be moved elsewhere. Given the positive results achieved, the company is also considering purchasing a machine for other sites. Another interesting initiative implemented in 2013 in France was the collection of coffee capsules which, after being used, are returned to the supplier who then separates the aluminium, which is recycled, from the coffee, which is used as compost.